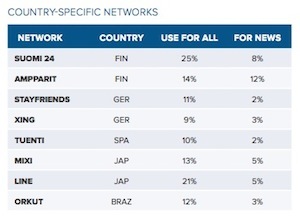 A survey across 10 countries find some things in common (Facebook’s everywhere) and some divergence (Finns dig Google Plus). By Joseph Lichterman @ylichterman June 11, 2014, 7:01 p.m.
News consumers are getting more mobile — but they’re not opening up their wallets much further. That’s according to a new survey published today by the Reuters Institute for the Study of Journalism at Oxford. Smartphones continue to take a bigger share of our attention: 37 percent of survey respondents said they access news on a phone at least once a week, and 20 percent said they primarily accessed news via mobile devices. But the percentage of readers who actually pay for news has remained stagnant. The survey asked respondents about their news habits in the United States, the U.K., Germany, France, Denmark, Finland, Spain, Italy, Japan, and Brazil’s urban areas. 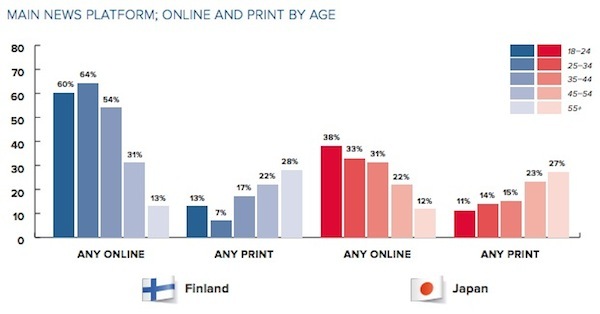 Even in Japan and Finland — two countries with traditionally strong print cultures — people under the age of 45 access more of their news online than in print. But after a sharp upturn in 2012–13 — when a large number of paywalls were introduced — our data show very little change in the absolute number of people paying for digital news over the past year. 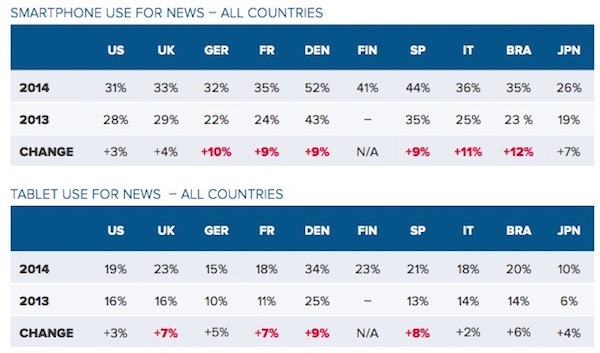 In most countries the number paying for any news is hovering around 10% of online users and in some cases less than that. Even so, our findings are consistent with the recent Pew research report in the United States which suggests that industry activity does not necessarily mean more individuals are paying for news but rather that ‘more revenue is being squeezed out of a smaller, or at least flat, number of paying consumers’. The low figures for the likelihood to pay in the future (for those not already paying) make particularly worrying reading in the UK and may be explained by the abundant supply of quality free news from the BBC, Sky, Mail Online, and the Guardian. But in other markets such as (urban) Brazil, Spain, and Italy there is more potential for growth. The full report — 93 pages and even more charts — is available here, but here are five findings we found particularly interesting. 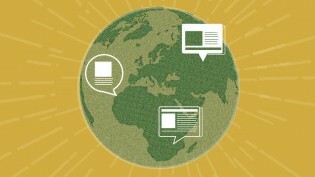 How people consume news on social media varies wildly from country to country, though there is one constant: Facebook. 60 percent of all respondents said they use Facebook, and 57 percent of those who use Facebook said they use it to consume news. Compare that with only 19 percent of respondents who said they use Twitter. (But 50 percent of those Twitter users said they use the platform for news.) The other main social media outlets for news are YouTube and Google Plus, which is big in Finland: 30 percent of Finnish respondents said they use Google Plus, with 11 percent saying they use it for news. 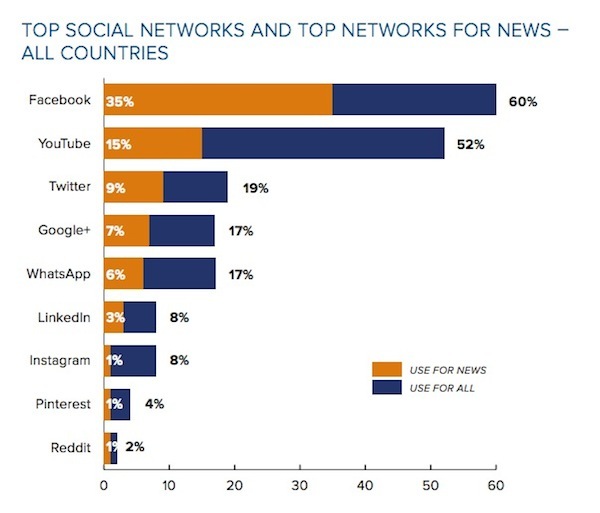 Beyond these main social media platforms, many people use social media platforms that are popular in their own individual country for news. This means it might be more challenging for some larger international news organizations that are trying to draw in readers via social media, Newman said. “It makes it very difficult if you’re trying to be a global publisher,” he said. But what Newman said the researchers found most surprising about how people are sharing content is the extent to which they use messaging apps like WhatsApp to share news. In Spain, for example, 60 percent of respondents said they use WhatsApp, with 26 percent saying they use it for news. A high percentage of WhatsApp users in Brazil and Germany also said they were using it for news. The latest trend in web design is mobile responsive sites, but the survey found that many people still access news on their mobile device via apps. In the UK, for example, 47 percent of smartphone users said they mostly use apps for news on their device — that’s a 6 percent increase from last year, and higher than the share who said they stick mostly to the web browser (38 percent). To some extent these data may reflect the strong penetration in the UK of Apple smartphones, which have tended to favour the use of apps. By contrast, in Finland where many people use Nokia phones, the use of apps on smartphones is far lower (around 30%), with most users preferring their web browser for news. The limited real estate on a phone screen and the more personalized nature of a smartphone may be responsible for people limiting the number of news sources they use on their mobile devices. 37 percent of respondents said they just use one source of news on their mobile devices, compared to 30 percent who only use one source on a computer. But multi-platform is not just about digital news. 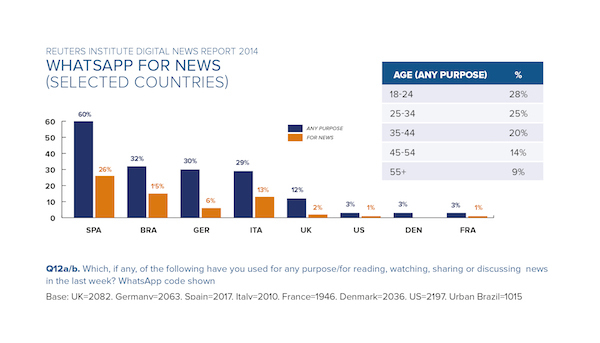 Across all of our countries, an average of 50% of those who access news on a tablet say they also read a printed newspaper at least once each week; 86% also watch TV news and we see similar patterns with smartphone users. Despite heavy investment from many news organizations in expanding their video and photo capabilities, most global news consumers still spend more time getting their news via text — traditional articles and lists — though video usage is higher in some countries, particularly the United States and Brazil. The survey asked respondents in five countries (the U.S., the U.K., Finland, Spain, and Germany) more detailed questions on video news. 24 percent of respondents, especially older participants, said they would rather watch video on larger screens while 18 percent, predominantly younger people, did not like how long it takes for videos to load online. Both BuzzFeed and The Huffington Post have several international editions and the type of “fun” viral content that they specialize in is becoming more commonplace around the globe. These types of stories — i.e. 27 Things That Are So Weird When You Actually Think About Them — are particularly popular in Japan, France, and Italy. 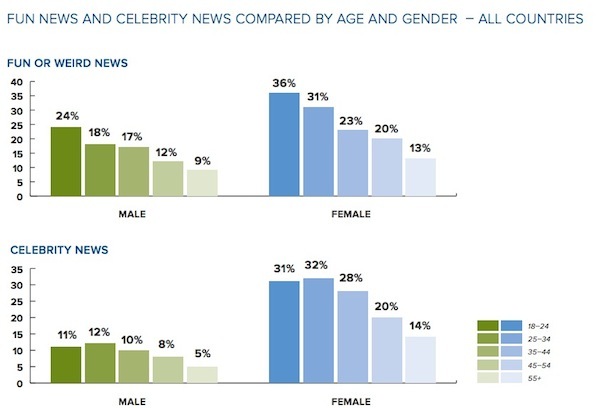 Overall, these types of stories are more popular than celebrity and entertainment news, according to the survey, because they interest both young men and women, whereas celebrity news predominantly interests women. 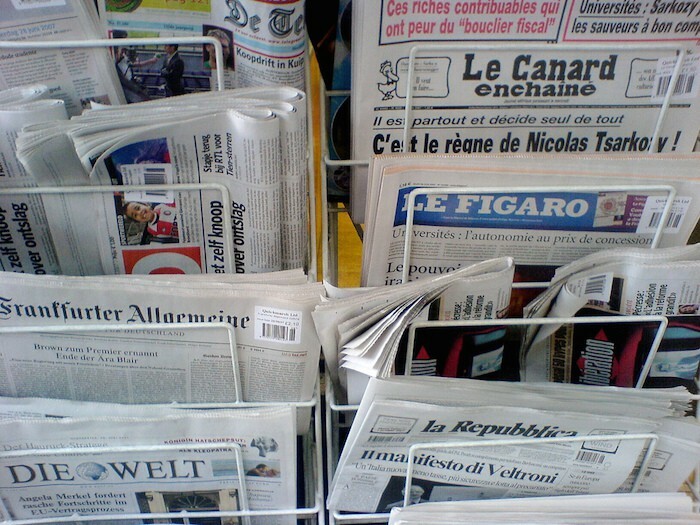 Photo of a newsstand by Steve Bowbrick used under a Creative Commons license. POSTED June 11, 2014, 7:01 p.m.
Lichterman, Joseph. "More people around the world are getting news on phones, but paying for it is still rare." Nieman Journalism Lab. Nieman Foundation for Journalism at Harvard, 11 Jun. 2014. Web. 19 Apr. 2019. Lichterman, Joseph. "More people around the world are getting news on phones, but paying for it is still rare." Nieman Journalism Lab. Last modified June 11, 2014. Accessed April 19, 2019. https://www.niemanlab.org/2014/06/more-people-around-the-world-are-getting-news-on-phones-but-paying-for-it-is-still-rare/.